Six candidates were certified as candidates for Murrieta City Council seats in the Nov. 8 election, with another applicant's signature verification pending. 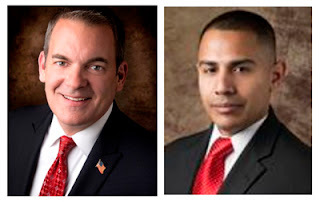 Current mayor Randon Lane (left) and council member Harry Ramos are seeking re-election to four-year terms. The other applicants certified are former council member Kelly Seyarto, Keelan McCullough, Bob Tyler and Brian Barton, who ran for a council seat two years ago. Rory Lovern is awaiting verification of his required signatures to qualify for the election.